Cosco has been an established brand since 1939 and has over 65 years of “recall-free” product innovation and manufacturing. Each product is carefully designed with the user experience in mind in promoting trusted utility tools and quality. Although it is advertised for a 1000 lbs load capacity, we do not recommend it for anything more than 500 lbs. The 3-in-1 design is its most innovative feature and it will come in handy to ease the burden of use for the user. The structure, however, is not a steel frame but aluminum, which can make it susceptible to extreme heavyweight. We recommend this for those looking for a versatile hand truck. 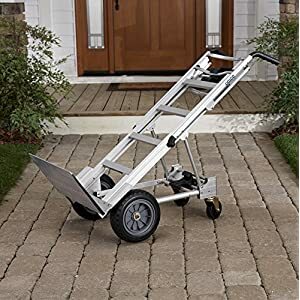 We do not recommend this for those looking for a rugged and put through its test type of hand truck. There are others reviews that this dolly has a poor build and the quality does not seem to live up to the Cosco brand. However, you need to keep in it is an aluminum frame and not steel. That means it is meant for easier usability making it lighter with different weight-bearing positions for better maneuverability. Does that mean I should not get this for heavier loads? Not necessarily. The product can be used for heavier loads however, we do not recommend for maximum weight capacity and for rugged use. It will get the job done, however, not in the way a heavy-duty steel frame dolly will. For clarity, this dolly can be beneficial for those who are careful with their use of it. Once again, we do not recommend this if you need a more rugged all-terrain type of dolly. In a product category that has a predictable design and functionality, it can be great to see innovation and something new. This product has been out for a while now and it has certainly stood the test of a proven concept among its users. We have to keep in mind that with innovation comes the need for change in user mindset. 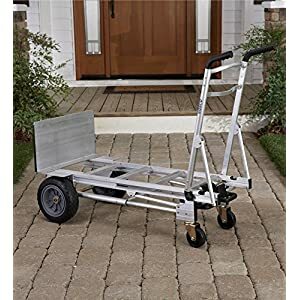 There are expectations put on this style of hand truck that could not be fair when compared to other rugged steel frame designs. It still carries with the same functionality however, it differs in how its new innovations can be applied to its user. That is not to say these products needs to be babied all the time and cannot take care of tougher jobs. It can handle tough jobs, however, the main thing to keep in mind is that the innovative design is meant to bring different options available to the user rather than making sure every weight load is a successful one. If you are someone who adapts well to innovative products then this is the hand truck for you. It will broaden your options in how different load bearing jobs can be done. If you just want a tough sturdy hard truck that can take anything you throw at it, then we do not recommend this item. You will quickly be disappointed and think less about its innovation and rate it based upon performance. Please do not think that it takes a special kind of person to use this hand truck. If the innovations are interesting and you’d like to see how it can expand your work options then this is the product for you. With any product review, there will be different opinions. The 3-in-1 Aluminum Hand Truck by Cosco is an innovative product backed by a long established innovative company. With that in mind, not every user will find it 100% satisfactory. Like any hardware tool, only a closeup, hands-on look will help determine if this can be a good fit for you. To keep things practical, do not take the weight capacity at its fullest advertised. 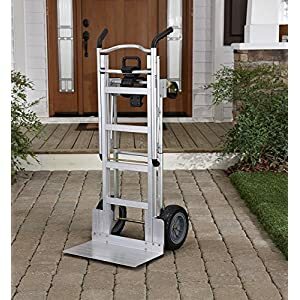 If you are looking for a 500lbs capacity hand truck that incorporates an innovative design for better user experience then try to demo this product before making a final decision. Remember, innovation brings innovative options. This hand truck can certainly help with that. Here is a helpful video to give you a better idea of the 3-in-1 Hand Truck.